Hey you there! Yes you! Just come home from work? Bet you're kind of hungry, yes? Hmmmm. What you need after a hard day at the office is an Uncle Bertie's Meat Pie. 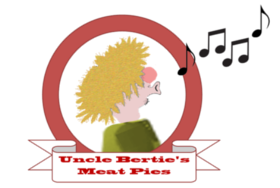 Uncle Bertie uses only the very best gristle and gelatine, which is why households up and down the country choose Uncle Bertie's Meat Pies time and time again. Look at little Johnny - he can't wait to get stuck into his lamb and onion pasty. And the way young Mary's eyeing that steak and kidney, it doesn't look like it will last long. Better be quick Dad, or there'll be none left! What's that Grandma? You want to know how we get our pork pies so shiny? Trust me, you don't want to know! But seriously, here at Uncle Bertie's Meat Products we believe that the old ways are the best. We make traditional pies, the traditional way - with traditional ingredients, and using tried and tested traditional methods. Of course, you're wondering how we can afford to provide such value for money? Well the answer's quite simple. All of our products are made by traditional idiots. We don't use fancy continental chefs, with their weird communist ideas about decent wages. Take a look at our packing plant: you won't find any snooty production operatives who think themselves above getting the odd limb trapped in a conveyor belt every once in a while. There are no unions here, and you can be sure that we won't sacrifice flavour for the sake of a little health and safety. At Uncle Bertie's Meat Products we use good old fashioned retards who are perfectly happy to work for practically nothing, and don't mind losing the occasional finger to the mincer. And have we got it right? You'd better ask Cousin Larry. From the way he's tucking into that sausage roll he doesn't seem to be in any doubt. Go for it Larry!